I ran across this letter. It was sent in December, 2013 to City Manager Brenda Fischer, the Arizona Attorney General’s Office, the Glendale City Council, the Arizona Republic and the Glendale Star. I received it in January, 2014. Unfortunately, it ended up in my stack of “stuff” where it has resided until today. I always meant to post it but obviously it disappeared into a morass of papers, never to see the light of day, until now. “As long time Glendale employees, we had high hopes when you were hired. We had hoped that the years of paranoia, suspicion and fear from the city manager’s office was over. It was not long after you started that we realized the reign would continue with a new face and some old ones. Your move to evaluate (sic) Julie Frisoni to acting assistant city manager was the start. You had to know that Julie Frisoni was one of Ed Beasley’s most trusted and loyal cohorts. How else would someone of her inadequate experience and limited education ever get hired. She was in on every deceptive move Ed every (sic) made. She sat in on every council meeting rehearsal, including those that are the focus of the recent audit. She knew everything! “It wasn’t until we started to pull the pieces of the puzzle together that we uncovered why you will soon be making Julie your permanent assistant city manager. So we are accepting your offer to ‘go around management’, ‘go to the Attorney General’s Office anonymously’, or ‘anonymously informing the media, to put some public pressure’ on an issue. “We know Councilmember Gary Sherwood met with you privately during your hiring process, which is a clear violation of common Human Resources practices. We know he was reprimanded by the city attorney’s office for secretly talking with you and advancing your application through the process. We know he put you in touch with Ms. Frisoni, who was a major, yet stealthy, player in his council election. We know the reason you promoted Ms. Frisoni was because Councilmember Sherwood asked you in exchange for his help in getting you hired. We know she is your closest confidant because Gary Sherwood surreptitiously used her to feed you information during your hiring process. We know her promotion is a ‘payback’ for insider information during your hiring. We know Ms. Frisoni was aware of and involved in Ed Beasley’s directives that led to the trust fund transfers. We know Ms. Frisoni was involved in the secret council meeting rehearsals with staff in which she used her media background to coach staff how to avoid answering questions from the mayor and council. We know the reason the Arizona Cardinals and the Super Bowl Host committee are penalizing Glendale is because they refuse to work with Ms. Frisoni because of the years Ed Beasley, Craig Tindall and Julie undermined the city’s relationship with the team. We know Ms. Frisoni could have helped those that the audit focused on but because she was not in the spotlight she cowardly choose (sic) to protect her own skin which simply shows the type of person she has become. We know Ms. Frisoni and media relations team spent years misleading the media, including the Glendale Star and the Arizona Republic. We know Bill Toops repeatedly complained about Ms. Frisoni’s inability and unwillingness to release information through the public records process. We know Ed Beasley and Julie Frisoni helped to cover for Alma Carmichael as she ‘telecommuted’ from Mississippi and Art Lynch as he bleed (sic) the city for his own personal benefit. We know Julie Frisoni mislead former Mayor Elaine Scruggs and former and current councilmembers to cover for Ed Beasley’s crimes. 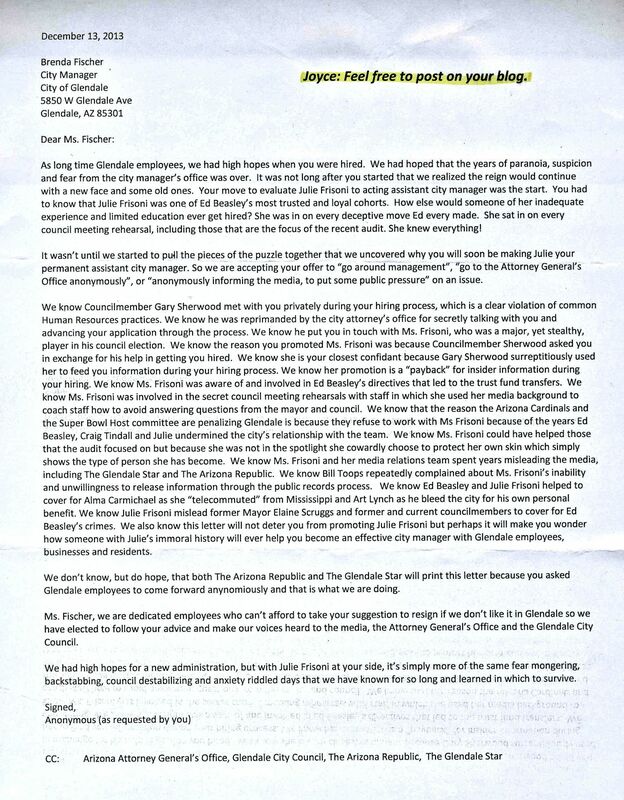 We also know this letter will not deter you from promoting Julie Frisoni but perhaps it will make you wonder how someone with Julie’s immoral history will ever help you to become an effective city manager with Glendale employees, businesses and residents. “We don’t know, but do hope, that both the Arizona Republic and the Glendale Star will print this letter because you asked Glendale employees to come forward anonymously and that is what we are doing. “Ms. Fischer, we are dedicated employees who can’t afford to take your suggestion to resign if we don’t like it in Glendale so we have elected to follow your advice and make our voices heard to the media, the Attorney General’s Office and the Glendale City Council. “We had high hopes for a new administration, but with Julie Frisoni as your side, it’s simply more of the same fear mongering, backstabbing, council destabilizing and anxiety riddled days that we have known for so long and learned in which to survive. It was Norma Alvarez who complained bitterly about Sherwood meeting with Brenda Fisher. This from a woman who met secretly with the TO and actually invited them to her investiture as CM despite the fact they were litigating against the city. I believe there is a legal term for consorting with the opposing party in a lawsuit but it escapes me at the moment. Let alone she (Julie) is NOT qualified to be an Assistant City Manager. Gary Sherwood in my opinion is a ZERO. Heard he loves to park himself in City Manager’s & Assistant City Manager’s office. Let’s face it, Glendale is really not represented very well. Yucca has a Councilman who doesn’t even have district meetings. Frankly he just loves to have that title behind his name.